Guest blogger Audrey Armstrong shares details about the excitement surrounding this summer’s introduction of e-Readers to Heritage Academy. E-Reader Day had finally arrived. The cafeteria was swept, mopped, and decorated. Chairs had been arranged. Songs and poems had been rehearsed by the students. 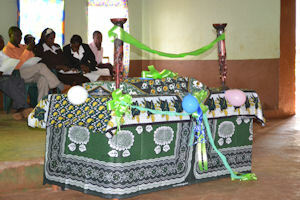 Government officials, special guests, community friends, parents, and family members had been invited and were assembling in the hall. Even some guests from Indianapolis were waiting with anticipation as the students and teachers filed in and took their places. On the table in the front of the room was a huge pile of something, hidden under a cloth. The program started with prayers of praise and thanksgiving followed by welcome songs and speeches from both leaders and students. Finally it was time for the main event! With loud cheering and clapping the veil was swept aside and e-Readers became visible on the table. Not just a few, but 50—enough for every 6th grader to have one. What followed was truly amazing. 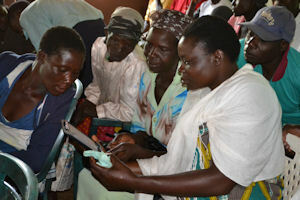 First came a demonstration by a few students showing how the e-readers were opened and how they could be read. 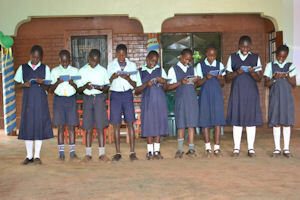 The remainder of the 6th graders were then handed their e-reader, and with joy and celebration, they moved into the audience demonstrating to their families and neighbors how print appeared on the little screens and more importantly, how they could read their own book. The parents were so overwhelmed with amazement and joy they formed a huge parade and were joined by visitors and students alike. Such clapping and cheering, dancing and hugging!! They all were celebrating the tremendous step forward for Heritage Academy students. The students were proud and excited with anticipation and the parents were amazed at the magic of technology being made available to their children as they continue to master the written word. How did this all come to be? When a Sunday school class in Indianapolis was presented with the need, they accepted the challenge to help these students get books and raised $10,000 to purchase the readers and provide for the training. What seemed like a large sum was raised quickly when a group of people each gave what they could. Next, VPA partnered with Worldreader to supply the e-readers and program them with text books and other books in both English and Swahili. The Worldreader team came to Heritage Academy, spending a week training first the teachers and then overseeing the training of the students on the use of the technology. (Such an exciting learning curve it proved to be!) The training team completed their work and joined parents and students in celebrating the successful beginning of a new era. The Sunday school class in Indianapolis joined with prayers and anticipation of changed lives and more opportunities for the students of Heritage Academy.